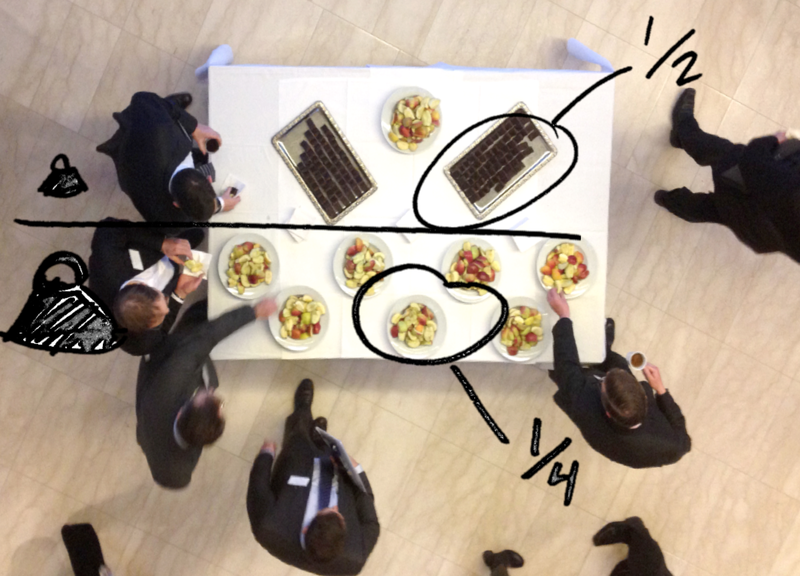 By simply re-arranging the buffet serving 500 CEO’s we increased the intake of fruit by 84% and cut the intake of brownies by 30%. The Danish Executive Summit is a prestigious yearly event for Danish CEO’s. This year more than 500 CEO’s attended the event, which took place in the Copenhagen Opera, featuring prominent speakers such as Jørgen Buhl Rasmussen (CEO & President for Carlsberg Denmark), Bjørn Kjos (CEO, Norwegian Air) and Tormod Askildsen (Senior Director LEGO). We decided that this was an excellent opportunity for us to show of nudging’s potential to positively influence behavior through subtle changes in the environment. Below we report how a mere re-arrangement of the buffet may significantly improve the intake of inexpensive healthy foods and cut the intake of more expensive less healthy food. For some time we have known from laboratory experiments, such as those conducted by Prof. in Consumer Behavior and Nutritional Science, Brian Wansink, that subtle changes in our environment may significantly change our eating behavior. People tend to eat less from smaller plates than they do from big ones (we also did an experiment on plates, so stay tuned), pour more into small thick glasses than into tall lean ones (yes, we also did something in this area, so, really, stay tuned! ), and in general to have their food choices influenced by a principle of convenience. Thus, when told that the Executive Summit would include a coffee break with apples and brownies, we decided to see just how far we could nudge the intake of apples relative to brownies by means of convenience – but this time in a real world setting. We made our arrangements so that the coffee break had two identically sized buffet tables. One featured a multilayered “intervention” buffet aimed at promoting healthy behavior while the other acted as a control table with reverse settings of the hypotheses underlying the experiment. Naturally, the control buffet reversed the nudges with non-sliced apples in the back, whole brownies in the front, and more brownies relative to apples. We were not allowed to physically separate participants into two identical groups, so instead we posted iNudgeYou team-members at the staircases leading up to each table and counted the exact amount of participants in the area around the buffets. (We also kept an eye on whether participants migrated from one table to another – they didn’t). Furthermore, iNudgeYou team-members discretely counted the number of people that visited each of the buffets. Due to the symmetry of the Opera foyer the spontaneous distribution of the 391 sampled people was neat, with (N=202) at the intervention buffet and (N=189) at the control. The buffets were continuously replenished by team-members from iNudgeYou along with the staff from Bojesen; and the entire experiment were overseen by Pelle Guldborg Hansen, Katrine L. Skov and Karsten Schmidt from iNudgeYou as well as Prof. Bent Mikkelsen and Laurits Rohden Skov from the MENU group, Aaalborg University. The results where staggering. 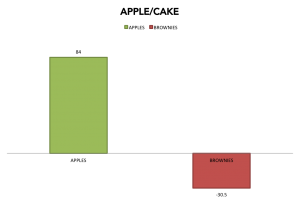 Total consumption of brownies was lowered by 30,2% per person while apple consumption was increased by 83,9% per person at the intervention buffet compared to the control. Figure 1: The change in fruit and cake intake. The experiment supports the hypothesis that mere presentation of food plays an important role for intake in real life settings. *The experiments carried out at VL-day where all sponsored by Rostra Communication, member of Danish Nudging Network. This experiment would not have been possible without all our iNudgeYou team-members and volunteers as well as: Bojesen Caterin, Rostra Kommunikation, Aalborg University (CPH), ISSP.